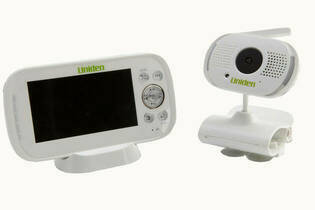 Snapshot: The Uniden Digital Wireless Baby Video Monitor BW3101 is an audio and video baby monitor with plenty of features. But how well does it perform? Has "talk to baby" function. Has mini USB port to monitor via PC. Has AV out port to monitor via TV. Allows video recording to micro SD card. Option to auto video-record when noise is detected. Large screen with clear, smooth picture. Remote monitoring via Baby Watch app (not tested). Poor sound range through indoor walls. Baby unit doesn't run on batteries.